We are aiming to bring Caledonia back to the quarry railway at Hollycombe and we need your help. Made by Andrew Barclay of Kilmarnock in 1931, Engine Number 1995 was supplied originally to the Durham County Water board for use on the Burnhope Dam project. Here it obtained its cabside number ‘70’, but was not named as such, however unofficially refereed to as ‘Black’ by the enginemen, due to its paint colour. Following the completion of the project in 1936, all the engines were placed up for sale, and No70 was moved to Raisby Quarries in Co Durham. She worked here until she was bought by Dinorwic Slate quarries in llanberris, Wales in 1948. 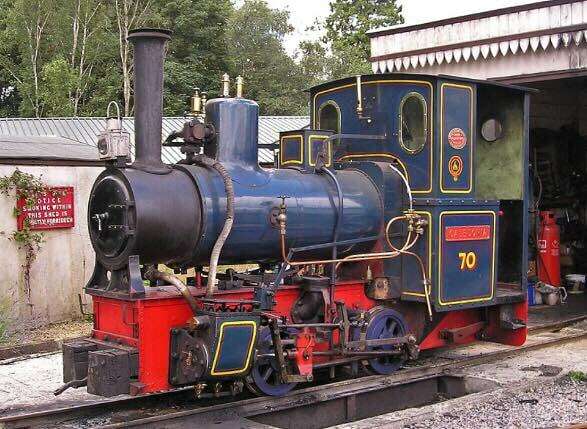 After some repair works she set to work as the newest member of the large existing team of Dinorwic engines, and at this time is her first encounter with what would turn out to be her long term friend, Jerry M. While under the ownership of Dinorwic, No 70, still carrying its Durham County Waterboard Number, was assigned to Port Dinorwic, for shunting wagons of finished slates arriving from the quarry to the ships for transport all over the world. However, as the 1960s begin, the quarries were finding markets tough and the industry saw massive decline, and in 1968 Dinorwic closed down, leaving No70, among other engines, once again out of use and up for sale. However good fortune fell in favour of the engine, as it was purchased by Commander Baldock, and would go on to be the first locomotive to haul passengers on the narrow gauge Quarry Railway at Hollycombe, and being joined later by her long term life companion, Jerry M. Once in ownership at Hollycombe, she was honoured for the first time with a name, ‘Caledonia’, taken from the Name of the works in which she was built. She worked hard and reliably up until 2007 when the firebox required some serious repairs and she was dismantled for work to commence. Sadly she has been out of use ever since.